When you create an event the party host receives the following e-mail from Shelf Reliance. It is automatically sent. Thank you for hosting a Shelf Reliance Party on 2011-05-10 7:00 PM. Heather Lorimer looks forward to showing you and your guests all that Shelf Reliance has to offer. We are always grateful for individuals who are willing to open up their homes to showcase the many wonderful Shelf Reliance products. In order to thank you for hosting a party, we have designed a fantastic Host Benefits Program that rewards hosts with exclusive promotions and programs. We want you to get the most out of your party, so we have included information about the great benefits you can receive. Free Product You will receive 10% of the total sales from your party in free product. For instance, if your party sales are $800, you will receive $80.00 in free product at retail price. Half Off: The total sales at your party determines how much you will receive in half off merchandise. For example, if your party total is $800, you will receive $150.00 to spend on products that are half off the retail price. In other words, you only pay $75.00 for $150.00 in product. The chart below lists the 50% off discounts you can earn. 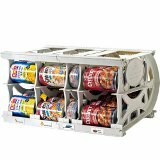 The Q: This program makes purchasing Shelf Reliance products easy and affordable for you and your guests. The Q is a wonderful way for you to build your food supply, while maintaining your current grocery budget. It is fully customizable, so you can choose the foods you want and set the total amount you want to spend each month. 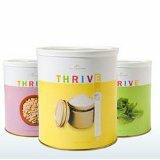 After you set the parameters for your Q, every month you will receive one shipment of delicious THRIVE foods right to your front door. The Q benefits the host because he/she will receive triple the credit for every guest that signs up on the Q. In other words, if someone attends your party and signs up for the Q at $100 per month, you would receive a $300 credit as the host. From Guest to Host: If one of your party guests signs up to host their own Shelf Reliance party, you will earn another $100 (retail) at half off. Double Dip Promotion: If someone buys product at your party, and also signs up to host their own party, you get the credit at your party, and they get the credit at their party as well. This prevents people from withholding orders until they host their own party. 1. Set Goals Set a goal for your party sales total, and choose the products you would like to get with your host benefits. Your consultant will do all they can to help you reach your goal! 2. Invite Your Guests Invite as many people as possible to your party. Typically only one quarter of those you invite can attend, so if you want 10 people to attend, you need to invite 40. Don't rule anyone out. You never know who is interested and ready to begin emergency planning. Shelf Reliance products benefit everyone, so start inviting today! Also remember, you can send out an e-vite or post card at least one week ahead of time. Call anyone who hasn't responded within a couple days to make sure they know about the party. Verbal invites or follow-ups tend to get the best results in attendance. To access your party account which allows you to send emails, go to www.shelfreliance.com/parties. On the top-right portion of the page, click “Login”. Enter your information under “Create a new account.” Once the consultant has set up a party page with you as the host using the same email you registered with, you will see the link “host home” when you log in. Once you click on that link, you will be able to manage your party on-line. 3. Collect Orders If someone cannot attend your party, ask them if you could take their order. Your consultant will give you a price sheet and order forms you can forward to anyone that would like to pre-order. They may also lend you a catalog for guests to preview. Remember that most people are really excited about the Q, so be sure to introduce it. 4. Remind Your Guests Be sure to give reminder calls a day before the party. 5. Set up Your Q Go to the Shelf Reliance website and set up your own Q. Then you will be able to help all of your guests get signed up quickly. 6. Prepare for the Party Review the host prep sheet your consultant will send you. Remember, to ask your consultant questions about the products or program ahead of time. 7. Get Excited Shelf Reliance offers so many beneficial products, so how could you help but get excited? Just remember, you want to pass that excitement on to all your guests. 8. Help Your Consultant Make sure your party goes smoothly by helping the consultant collect orders after the party. Thank you for taking the opportunity to Host a Shelf Reliance Party. We are so grateful to have devoted customers, like you, who are willing dedicate their time to spreading the word about Shelf Reliance. If you have any questions concerning products or programs, please visit our website before your party to familiarize yourself with what we have to offer. If you have additional questions please do not hesitate to call your consultant or our knowledgeable customer service department.